I am delighted to let you know that my photograph titled “Maasai boy” has been Highly Commended in International Color Awards 2014! This year the contest received 7,400 entries from totally 79 different countries worldwide, were my image won a Honorable Mention in the Silhouette category. Of course when going on safari in the African bush and highlands my main goal always is nature and wildlife photography, and I can tell for sure that not a second use to be spoiled… But sometimes on the way photographing people also can be interesting and great fun. This young Maasai boy I saw outside a small village named Talek on the outskirts of Maasai Mara. The setting is not arranged, he was just stopping up for a few seconds waiting for another guy, maybe his brother, when I got aware of him. Usually one does not photograph people with a 600mm, but this photograph is created with such a long telephoto lens. The picture is taken right after sunset and what I like the most, besides the boy´s natural posing and the calmness in the situation, is the silhouette effect that simplify and emphasize the subject´s uniqueness and strength. Please click on the image to enlarge and leave your comments if you like. Also feel free to follow and share my work on Facebook as well. 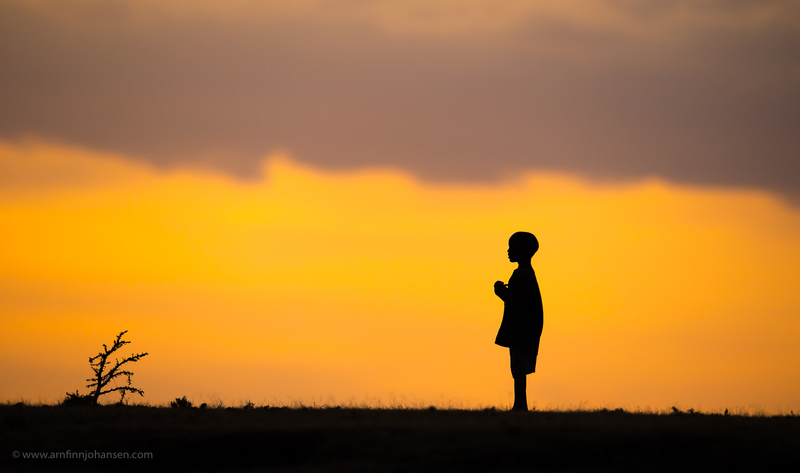 Maasai boy in silhouette photographed outside Talek village in Maasai Mara, Kenya. Highly Commended photograph in International Color Awards 2014. Nikon D4, Nikkor 600/4 VR, 1/800 sec at f/5.6. -1/3 EV, ISO 320. Excellent work lovely capture, i really envy you. all the best for more of your lovely images. Gratulerer igjen Arnfinn – du mestrer jo både folk&dyr! Supert bilde! Arnfinn, this is a stunning image for sure ! It\’s a very strong image in my opinion, the reason being it a silhouette shot with just a few beautiful colours makes it even stronger. Such images tell stories, many people will look twice to this one to let it sink in and it\’s up to the viewer which story it will be. Congrats with your reward ! Gratulerer (igjen:))! Dette var jo strålende! Et flott siluettbilde me den nydelig bakgrunn. Grattis med mer heder og ære!